Did you know yesterday was National Potato Chip Day? No? Me either. Well, not until after I already had these beautiful purple sweet potatoes already in the oven ready to become my snack for the day while I watched college basketball. (Go Badgers!) But alas, it was yesterday, so this post comes a day too late but close enough in my book. I’ve recently begun to have an obsession with purple sweet potatoes. They’re literally the prettiest things I’ve ever seen. That is other than rainbow chard and rainbow carrots because… well.. they’re rainbow colored. But there is nothing better than cutting into a potato only to see that bright purple flesh staring right back at you. Can eating whole foods be this pretty? Why yes, yes it can. The brilliant purple hue gets lost a little bit in these baked sweet potato chips due to the extended time in the oven. I won’t lie to you, I was a little sad when they came out of the oven and I saw that the purple turned a little brown. But the taste, oh the taste! So delicious! My method for these chips was low and slow in order to not burn the chips. I did try cooking the chips at 400F for a shorter period of time which resulted in prettier chips but they weren’t as crispy as I would like them. So my suggestion is a lower temperature for a longer amount of time but feel free to play with the temperature. The thing about making baked chips is that you need to keep an eye on them and check for any chips that are done and take them off the sheet while the others continue baking. Otherwise, you’ll probably end up with burnt chips. Trust me. I’ve had a lot of burnt chips! 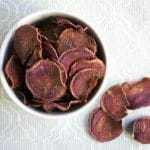 Super easy baked purple sweet potato chips that are not only pretty, but delicious too! Gluten-free, dairy-free and vegan. Preheat oven to 250F. Line two baking sheets with parchment paper and set aside. Slice potatoes with a mandolin. You will want to have your potatoes cut as evenly and thinly as possible. In a bowl, mix together the coconut oil and the sliced potatoes. You just want to lightly coat the potatoes. Place the potato slices in a single layer on the baking sheet. Sprinkle with salt. Bake for 35-45 minutes flipping the potatoes once or twice throughout baking. Make sure to keep an eye on the potatoes and remove any potatoes that are crisp. Bake until the edges of the potatoes are curled and the potatoes are just barely crisp. Let cool for 5-10 minutes. These unfortunately don't store too well, so it's best to eat them right away. However, we did eat these the next day with most of them being crispy (the soggy chips were still tasty!). Store in an airtight container. I just made my first batch of these. They took quite a long time for them to get crispy (50 minutes) in a true-to-temp oven. I think I’m going to reduce the coconut oil for the next batch. Thanks so much for sharing your feedback Sarah! There can be so many factors that affect how long the chips need to cook for so I appreciate you sharing! Thanks for stopping by ?